Small, weeping deciduous tree (H 3-5 m, depands as well on grafting height, W 3-4 m). Crown dome-shaped, dense, branches distinctly hanging. Bark on young shoots dark green, later grey. Leaves pinnately compound (20-25 cm), 7-17 leaflets, green, underneath grey-green. Flowers in upright panicles (20-30 cm), pea-like (1-2 cm), light yellow. Flowering period: July-August. Attracts butterflies and bees. 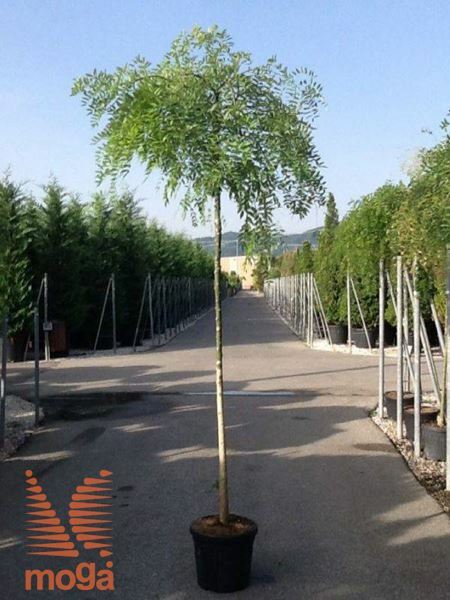 Undemanding, tough tree, grows well also in poor soils.